These are just delicious! They come in mommy sizes and little girl sizes, too! 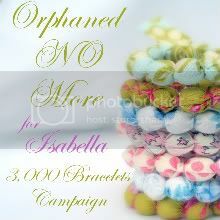 Daleea is trying to raise funds to bring Isabella home and these bracelets are being sold so you can help! Nicole takes horseback riding lessons. We haven't been able to go in a while because of the weather or illnesses or just stuff getting in the way. But I LOVE to go to the barn. It's just such a different environment for the kids - ya know, us city slickers. It gives me a little taste of growing up and being around a big red barn and farm animals with horses, cats, birds. My Grandpa Stambaugh raised and raced horses as a hobby. My friends, sister's and I spent lots of time riding in buckets on a horse walker. There's nothing like the smell of being at the barn, even the yucky stuff smells good to me! Nicci loves to ride the horses. She usually rides a 20 year old horse named Chief, but today she rode Buddy. Chief was busy roaming around enjoying the grass and taking the day off. Buddy tends to have a mind of his own, but it was good for Nicole to have a bit of a challenge this morning. This morning we had a treat. A 5 day old baby colt!! His name is Chevy and I got to pet him, then shortly after the momma tried to nip at me :). It's OK, she was just protecting her baby boy. Isn't he just the sweetest! I wanted to take him home. It was six months ago today in a hotel meeting room in Inner Mongolia that we met Avery Lan face to face. Since then she has learned a new language (although I'm pretty sure she still remembers some Chinese), gained about 5 pounds, grown about 3 inches, gone from a 12 month size (barely) to a 2t, learned to like new food, gained 2 brothers, 2 sisters, a mom, a dad, and a whole slew of family and friends that love her. The day we landed in Hohhot, Inner Mongolia on December 13, 2009 was incredible. We were told that we would meet her at 2:30 that afternoon. This would give us enough time to get settled into our hotel and for Lyndal to exchange some $$. When we got to the hotel the guide told us to go to our room and she would call us, and told Lyndal where to go to exchange the money. So, he walked out of our hotel room and not 5 minutes later our guide called and said that the baby was here! I had to find Lyndal! I wanted to catch him before he got to the bank, but I also didn't want to accidentally run into her and the orphanage staff before I found Lyndal. I wanted us to be there together to see her at the same time. Do I take the elevator or the stairs??? I was trying not to make eye contact with anyone so I wouldn't accidentally find Avery and her entourage first. Finally we found each other in the lobby and I told him that she was here and that we were to go to the hotel meeting room on the 2nd floor. We walked in and she was standing at the coffee table holding this wood block sign thing. She looked at us with her eyes wide. Then she looked at her nanny. Her nanny pointed to us and said, "Momma, Ba Ba." Avery looked at us again then looked at the nanny. I moved slowly and didn't want to scare her at all, or any more than she already was. I REALLY wanted to pick her up immediately, but knew that might not be the best thing. There was a chair behind her and I sat in that. She was definitely aware that something very serious was up and began to cry. I knew that if I were to burst into tears that that might also scare her, but my eyes were definitely wet. Then the nanny started to cry which made me start to cry. Avery was sobbing by now. I finally picked her up and she arched her back and fought me. They had to take a picture of her by herself. So, she was taken from me, sat on the floor, photographed and then I was able to pick her back up. By this time, the nanny is sobbing, I'm crying, and Avery is NOT happy. By that evening she was playing with both of us on the bed in the hotel room. It was one of the most amazing days. The first time we met Avery was a lot like the days I met my children I physically gave birth to, but still very different. It's hard to describe. But this is a wonderful ride we are on, and I'm having a lot of fun! It's time. Carlie got promoted. Avery got promoted. Carlie is now in a big girl bed and Avery is out of our room and in a crib upstairs. It's nice to have my own room back where I can read at night before going to bed without holding a giant flashlight under my chin. What do the girls think? Well, Carlie gets out of bed just a couple of times for a kiss or a drink of water or to go potty (liar) or to tell me something. And Avery fusses for about 2 minutes then she's out. Ethan inherited Conner's gently used bed and he's just fine except for all those girls in his room. Sleeping in peace at the McMurphy house! We got one of 'those.' A teenager. And he's grown and is still growing a lot this year. I had to buy him his FOURTH pair of shoes since August the other day - FOURTH! He is 5'10" and wears a size 11 shoe. He outgrew his twin bed so we had to go to a full. Don't get me wrong, if he's gonna grow then grow nice and tall son! But, it's the sleeping thing . . . I know he needs a lot of sleep . . .
you know, so he can grow some more . . . But how late is too late on a lazy summer morning?